Guess how Watson and Crick opened one of the most important papers in the entire history of science. Why aren’t we teaching the ABT at the very start of all science courses? You want to know how to do the most to improve the communication habits of scientists? The answer lies in these three letters. This will be part of my agenda next year with my new book from University of Chicago Press. IPSO FACTO, ABT. Try it for yourself. The structure is right there. 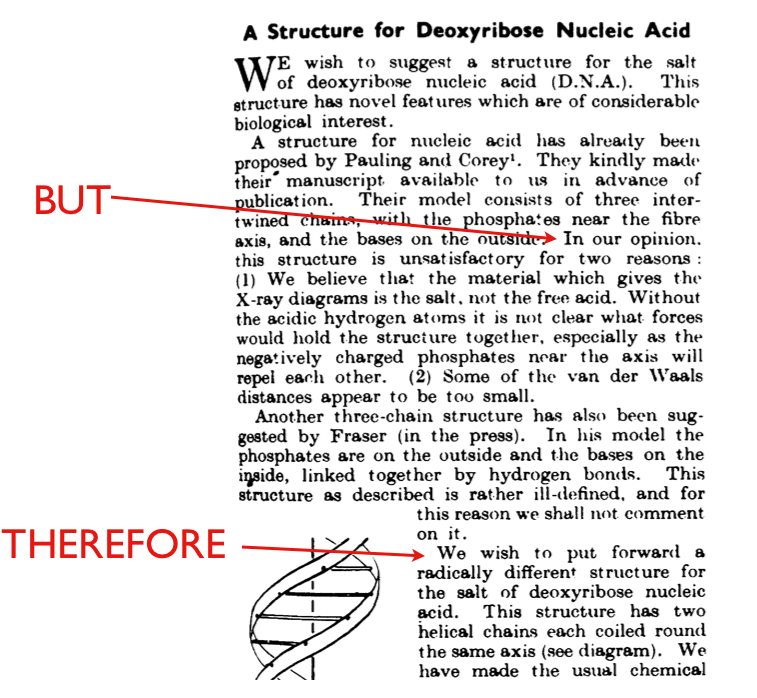 Just add the words to the opening of Watson and Crick’s famous 1953 Nature paper describing the structure of DNA. And of course Watson went on to write one of the best pieces of science writing ever with, “The Double Helix.” These facts are not coincidence. Earlier this year my buddy Park Howell at the Arizona State University Business School pointed out that the Gettysburg Address is an ABT. Last week at the North American Congress for Conservation Biology (NACCB) meeting, I met the wonderful Anne Greene, author of “Writing Science in Plain English” — a book that every science student should put to use. In her book she points to the sheer elegance of Watson and Crick’s landmark 1953 short paper in Nature where they presented the structure of DNA. She views that paper through her lens of simple English (it’s a marvelous example of using short words where others might use long ones). I view it from my lens of the ABT. Yes, indeed, there it is — as clear as day, the ABT structure to open their paper. The paper really is a masterpiece of effect research science communication. They open with two sentences that serve as an abstract, telling you what the paper is about. Then they launch into three sentences that could be connected with AND’s. These are then followed by the BUT. Of course, they don’t have the “but” in the actual paper, however, if you put it in, you see it fits perfectly. Their “but clause” (do I sense a new term?) has two points along with a third separate point they dismiss, then they get to their part of the story where you could seamlessly add a THEREFORE if you wanted. Just like the Gettysburg address, it shows the potential scaffolding nature of the ABT — the idea that if you create a good ABT structure you can then remove these connector words and it stands up just fine. We had two great workshop sessions last week at NACCB built around people developing their ABT’s. I’m now in the thick of my new book on narrative with University of Chicago Press. The ABT will be a central component. Lots more to come with it. And for all the communications people who think the ABT is “something to add to your communications tips and tool kit,” I’m sorry, but no — it’s not a tip — it is THE essence of effective communication because it is THE narrative template. It’s where it all begins. And over the long term, if you’re not communicating narratively you’re not communicating effectively. That’s not a tip—it’s a rule. BEST OF THE BEST. Great people with great stories. 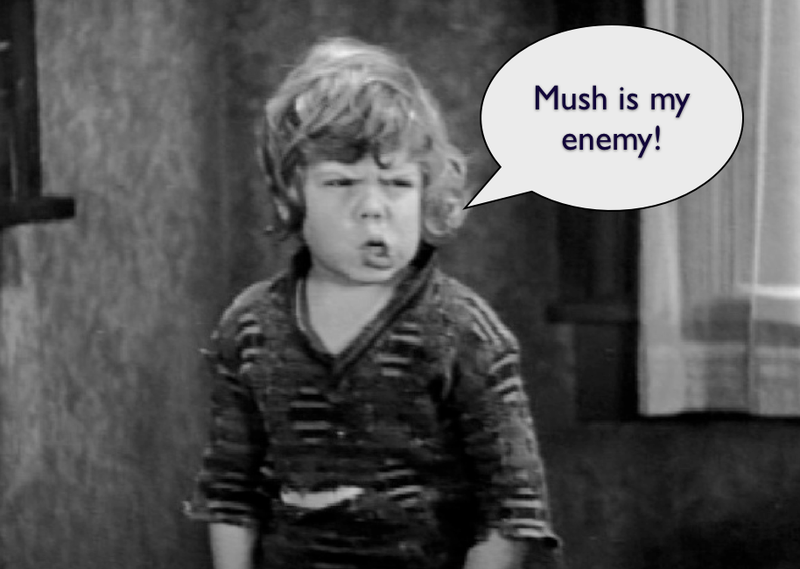 I’m on my way to Missoula to fight the Mush Wars, but in the meanwhile, here’s five great presentations, all of which are both concise and compelling. This sort of communication is the antidote to mush. #357) Is Al Gore the Worst Climate Communicator Ever? 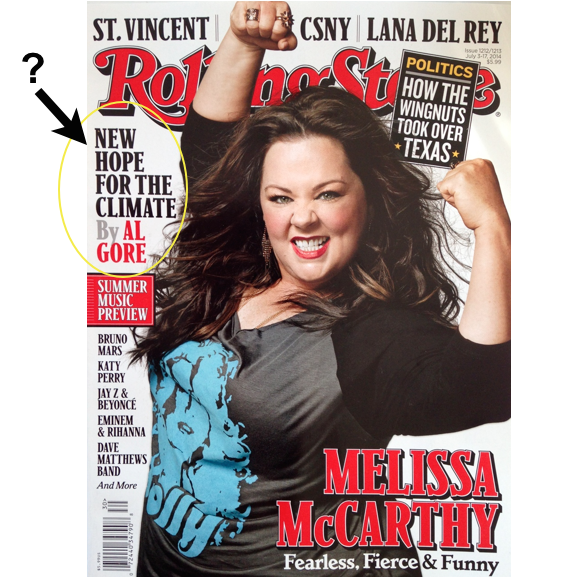 On the cover of Rolling Stone this month he says there’s “new hope” for the climate. But I thought the latest IPCC report said things are more dire than ever. Why would you go with such a cheery, “We’ve about got this thing licked!” message given what everyone else is saying? More importantly, what do you do when hope and truth are in conflict? SAY WHAT? Yes, I know you have to give people “hope,” but what if that gets in the way of the truth? “ROUNDING THE CORNER ON CLIMATE” — REALLY? In 2007 I was on a panel discussion at the LA Times Book Festival with Bill McKibben. 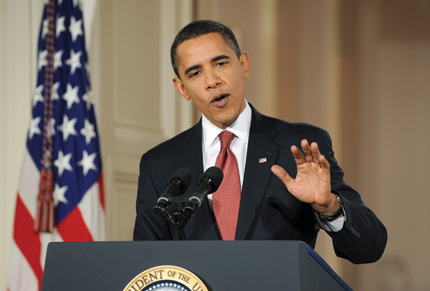 At one point he cheerfully said, “I think we’ve rounded the corner on climate.” I did a double take. He cited two big events from the previous year: Gore’s movie and Hurricane Katrina which he felt shocked the public as they got a glimpse at what a climate disaster looks like. I tried to take issue with him, but it was too soon. It would take another 2 years until Climategate showed how inept the climate science community was with public relations, and 3 years to the summer of 2010 when the last piece of climate legislation would collapse, finally showing how wrong he was on the rounding of any corners. So which is it? This prominent scientist says we need more fervor. But blasting out the headline of “New Hope” sends the opposite message (and yes, it is possible to have both, technically, but we’re not talking about substance here, we’re talking tone/style—the tone of “new hope” says we’re winning). Gore’s headline should have been, “We Need New Fervor for the Climate.” And if his answer is, “The editors made that headline up,” then he should have made sure they didn’t. In today’s short attention-spanned world, headlines are about 90% of your communication effort (the text is just a bunch of stuff to justify the headline, meant only for people with a lot of time on their hands). Apparently the same deal for Gore (or at least whoever shapes his messaging). 356)	Are Inventors Better Listeners? Scientists may not be the best at listening, but what about when they are inventors? I had a mind-altering experience yesterday with the AAAS-Lemelson Invention Ambassadors, leading me to connect the dots with what improv teaches. THE AAAS-Lemelson INVENTION AMBASSADORS. Among many amazing attributes, they appear to be role models for the ability to listen. From left: Karen Burg, Paul Sanberg, Vinod Veedu, Sorin Grama, Paul Stamets. In the years since its publication I’ve had countless experiences that have made me flash back to that comment and think, “He’s so right.” And of course the reason my crazy acting teacher screamed at me the first night of acting class (which was the opening scene of my book) was exactly that — she knew that heavily educated people have a hard time listening. But yesterday I had my head spun around by the group of five Invention Ambassadors assembled by the American Association for the Advancement of Science. Actually, the head spinning began two weeks ago when I started a series of phone calls with each of them, listening to what they planned on presenting in their 12 minute talks to the public (I was brought in by the AAAS folks to work with them on their presentations). I went to work with them searching for good stories in the “moments of discovery” that I knew they all must have experienced. Sure enough, each one had a single great moment to relate that included a moment of collaboration, a moment of pulling a discovery out of the ashes of failure, a moment of breaking the boredom with a discovery, a moment of using a daughter’s Barbie Doll dish to take care of a carpenter ant problem with mycelia, and a moment of realizing there are large numbers of inventors at universities who suffer the same perception problems of the academic world not appreciating their efforts. Five great stories. But the thing that stunned me was their ability to listen. I had feared I might have a group of people saying, “Look, we’ve given lots of talks, we don’t need your input.” I mean seriously, one of them had given a TED Talk that has scored over 2 million views. Why wouldn’t they tell me to get lost? But they didn’t. They listened. They experimented. They pushed my suggestions further. And they ended up giving really great talks that will be posted soon. I think what was most important was what they didn’t do—they didn’t negate. They basically took every suggestion with the same sort of, “Yes, and …” approach that is the centerpiece of improv training. I don’t think this is a coincidence. The ability to listen like this is not something that people pick up overnight. It’s a long term process. I see it with improv instructor Brian Palermo. He is unlike anyone I’ve ever collaborated with. He’s really great to give notes to because he is so deeply trained, with his 20 years of improv experience, in how to listen. It’s a crucial resource. 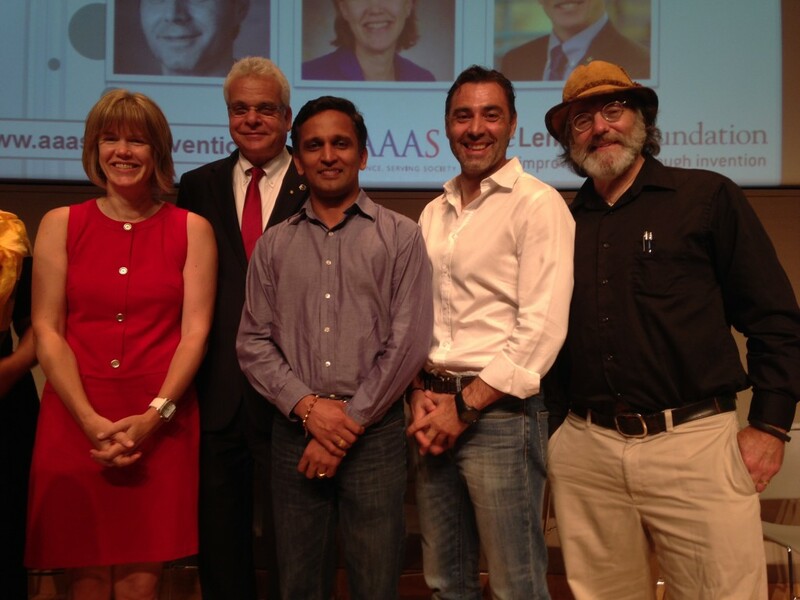 This Invention Ambassadors program is a new thing for AAAS. They are just now figuring out how to make best use of them in the upcoming year. I think one thing they should have them talk to the science community about is how they all seem to have developed this exceptional ability to listen. There are lots of very impressive things about these five individuals, but to me, this is one of the things I really wasn’t expecting. And again, I’m certain it’s not a coincidence. Great ideas come from people who know how to listen.